We have all experienced grief and loss at some point in our lives. Whether it was the loss of a loved one, the termination of a relationship, the loss of a job, or the death of a pet, you have probably experienced that emotional rollercoaster. While you may feel like you should be putting yourself back out there or getting over it faster, just know that your desire to be alone, sad, and angry is normal. There is no right way to grieve. While everyone’s grieving process looks different, Elisabeth Kubler- Ross has declared five stages of grief and loss that are universal. These five stages include Denial, Anger, Bargaining, Depression, and Acceptance. These stages do not necessarily happen in any particular order, each stage can re-occur several times, and some people don’t even experience every stage. However, understanding these five stages may help you recognize the ups and downs you may be feeling and consider that what you’re feeling is normal. 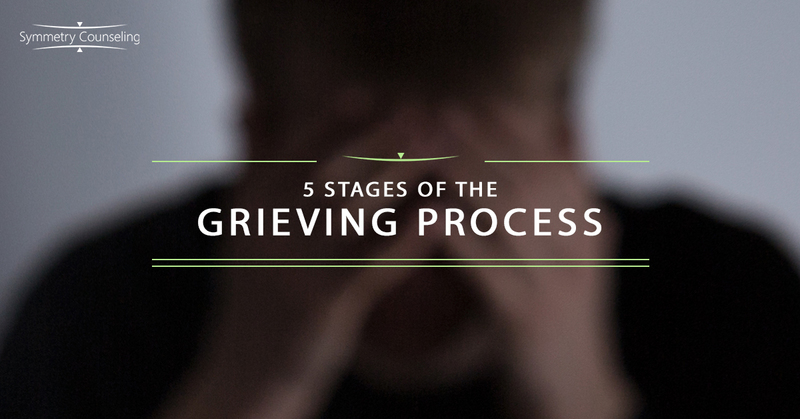 Below is a more detailed description of the 5 stages of the grieving process. The stage of denial is often accompanied by one being in a state of disbelief. It is common for individuals to initially deny the reality of the situation, as the news of such a loss may be too difficult to bear. Thoughts such as, “This can’t be real.” or “How can this be happening?”, begin to enter your mind as you try to understand how your life can change in the blink of an eye. During this stage people tend to experience fear, avoidance, confusion, and shock as they try to process the reality of the situation. As you come to terms with the reality of the loss, anger begins to set in. Thoughts such as “Why me?” or “Life isn’t fair” come to mind as you can’t understand why this had to happen to you. It is easy to want to be angry and blame others as you may resent them for leaving you or causing you pain. This anger could be aimed at objects, friends, family, therapists, or even the deceased, and typically dissipates over time. The most important part of this phase is to allow yourself to feel the anger. The more you allow yourself to feel, the quicker you will feel it dissipate. When we feel vulnerable and out of control of a situation, we tend to seek out a solution. Oftentimes, this solution includes negotiating with God or a higher power. For example, one might say “If you let my mother live, I will be kind to her from this moment forward” or “ Maybe if I would have left two minutes sooner, the accident wouldn’t have happened”. Guilt is often associated with bargaining as it is common to feel like there is something you could have done to prevent this loss from happening. In this phase, there is a lot of asking yourself “what if?” and reflecting on how things could be different. Depression is an emotional state people identify with when they think of loss. It represents the emptiness you can feel when a person or situation is no longer a part of your life. During this time the world may feel so overwhelming that you don’t want to interact, socialize, get out of bed and instead just want to withdraw. When people feel depressed over a loss they commonly feel helpless, overwhelmed, sad, and feel a strong urge to flee. It is important during this time to seek out support and utilize those around you who want to be there for you. The final stage of the grieving process is acceptance. During this stage you feel like you are going to be okay regardless of the loss and situation. Acceptance does not mean that you are “okay” with the fact that you lost your partner or lost your job, but you accept that it happened. A part of you recognizes your new normal and considers what may lie ahead. It takes a lot of time and adjustment to get to this place, and while it doesn’t fix the situation, it helps you move forward. If you are currently going through the process of grief and loss and would like some support, it may be useful to connect with a therapist. Contact Symmetry Counseling at 312-578-9990 to set up an appointment with one of our very skilled therapists today!